Although it graciously offers some hat-tips to the Marcel Breuer-designed building that’s been the Whitney Museum’s home since 1966 (grid-like ceiling, spacious elevators opening directly onto the galleries), the Renzo Piano-designed 220,000-square-foot Downtown Whitney (three times the uptown space) is, in many ways, the anti-Breuer. The current granite-clad facility presents a dark, somewhat forbidding aspect to the street. In a moment of imprudent candor, the Whitney’s director, Adam Weinberg, once told the highly receptive City Planning Commission: “As much as I love the Breuer building, the darkness of it and the moat scare people who think there are alligators and not art in there.” That building’s somewhat hermetic, inflexible interior spaces sometimes imposed vexing restrictions on curatorial creativity. 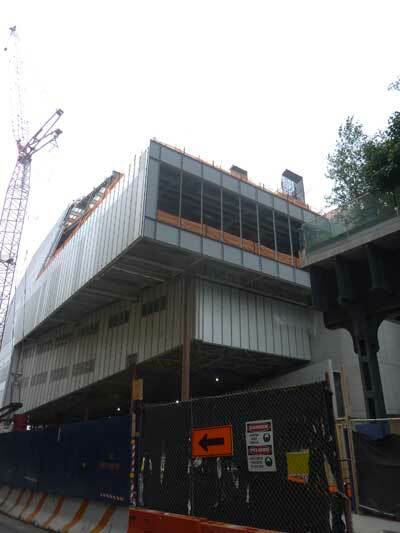 Unlike the Breuer, the new facility will be light on the outside—clad in steel panels (not yet installed) that will be painted a blue-ish gray, according to Elisabetta Trezzani, the partner in Piano’s firm who is overseeing the project. It will be expansive and airy on the inside—enormous, column-free floor plates that the curators can partition (or not) as they wish. What’s more, the new Whitney is committed to being what Piano, at yesterday’s press preview, called “a civic space.” A 8,500-square-foot outdoor plaza and a 6,000-square-foot ground-level lobby, including a gallery, will be open free to the public. A street-level restaurant (but not the scenic eighth-floor café) will also be open to all comers. Adding to the new Whitney’s street appeal may be projections or other art projects realized on the north-facing gray wall of the terraces, as chief curator and deputy director Donna De Salvo told us yesterday at the press preview. As described by Donna with contagious enthusiasm, the new building boasts several other game-changing advantages over the old. Perhaps most importantly (as I mentioned this morning on WNYC), it provides the opportunity to show a much broader, deeper sampling of the 19,000-work permanent collection, soon to be alloted two spacious floors instead of a single cramped one. Artists who were recently invited to preview the space admired the skylit top-floor gallery, to be used for special projects. What’s more, the museum will at last have an auditorium for lectures and performances. With the Hudson River as a backdrop, the planned theater strongly reminds me of the Diller Scofidio + Renfro-designed performance space at the Boston Institute of Contemporary Art, which frames a view of the Charles River. Less glamorous, but crucially important, are the back-of-the-house additions—a print study center, a much larger and more fully equipped conservation lab, an education center with state-of-the-art classrooms, and something particularly dear to chief curator and De Salvo’s heart—a proper loading dock for large-scale artworks. Artists invited to preview the space recently particularly admired the skylit top-floor gallery for special projects. 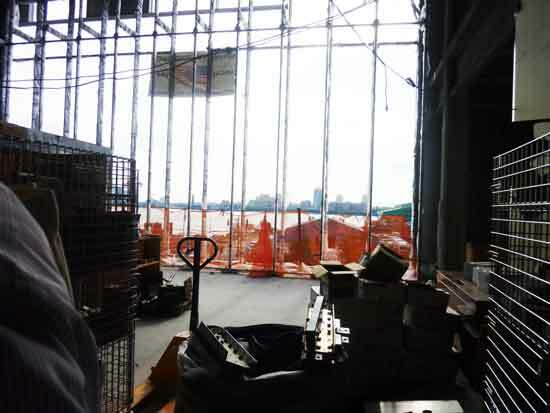 As I mentioned on WNYC, even the permanent-collection galleries may feel impermanent—vast expanses to be partitioned, disassembled and re-partitioned with temporary walls (what I termed “knock-down architecture”). Since the parameters and requirements of the permanent collection are (notwithstanding an active acquisition program) mostly known, I think those works—particularly the older, smaller-scale pieces, installed on the seventh floor—could be shown to better advantage in well proportioned, purpose-designed galleries. Dedicated galleries for light-sensitive prints, drawings and photographs would seem particularly desirable. 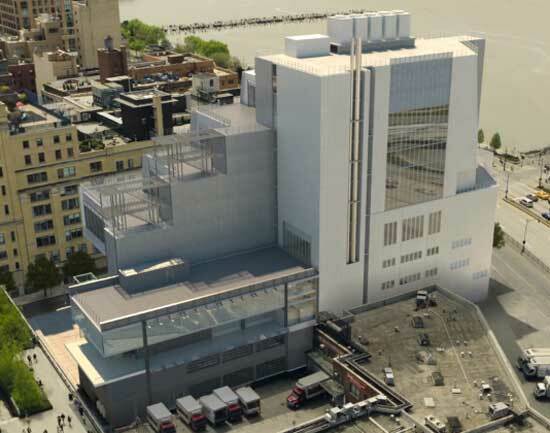 The other downside is the distinct possibility that we may never seen the Whitney in its flagship Breuer building again. Perhaps we should stop calling the new Whitney “the Downtown Whitney”: It’s far from clear whether the museum will ever realize its original intention to maintain two farflung facilities. For now, the Metropolitan Museum intends to lease the Breuer building for eight years, renewable. Hit by the double whammy of the 2008 recession and the ravages of last fall’s Superstorm Sandy (which flooded the entire basement and destroyed mechanical equipment that was about to be installed), the Whitney has had its hands full in trying to meet its twice increased $760-million fundraising goal for the new facility. At this writing, it’s still about $176 million short. It’s also more than two years late: Projected in 2008 to open in late 2012 or early 2013, it’s now scheduled to welcome visitors some time in 2015. 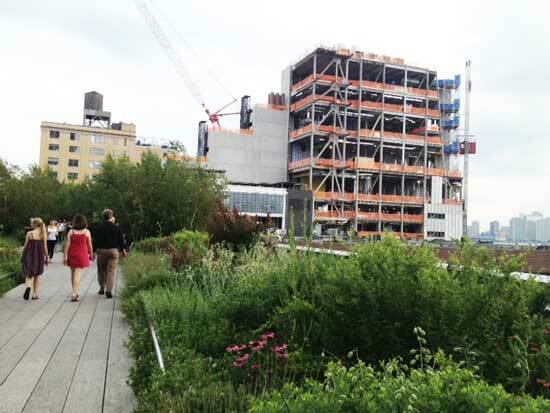 As I had suggested on WNYC back in 2008 (when it appeared that fundraising for the project was faltering), the Whitney may have bitten off more than it could chew. Maybe one reason for the surprisingly premature press preview was to generate publicity to stimulate new donor excitement. We can only hope that a facility not originally intended to be the sole Whitney will be up to its possible redefined purpose. That said, the new Whitney, an uncharacteristically sculptural creation by the usually decorous, right-angled Piano (with sloped exterior walls and off-kilter stacked layers on its gallery side), promises to be an exciting addition to New York’s cultural life, especially as a showcase for changing displays of large-scale contemporary works by American artists.